Bitcoin has been making a lot of news lately. The cryptocurrency shot up in value by over 200% in 2017, making many people fear that the market is in a bubble. Last week, China decided to close its bitcoin exchanges, which caused investors around the world to panic about the currency’s long-term viability. But how many people own bitcoin, and how is the currency distributed around the world? Check out our new visualization. Our graph represents the entire bitcoin market, which has a value of around $60 billion. For comparison, that’s bigger than several well-known companies, like Fed-Ex and General Motors. We then divided the value of the bitcoin market by address. As you can see, over 95% of all bitcoins in circulation are owned by about 4% of the market. 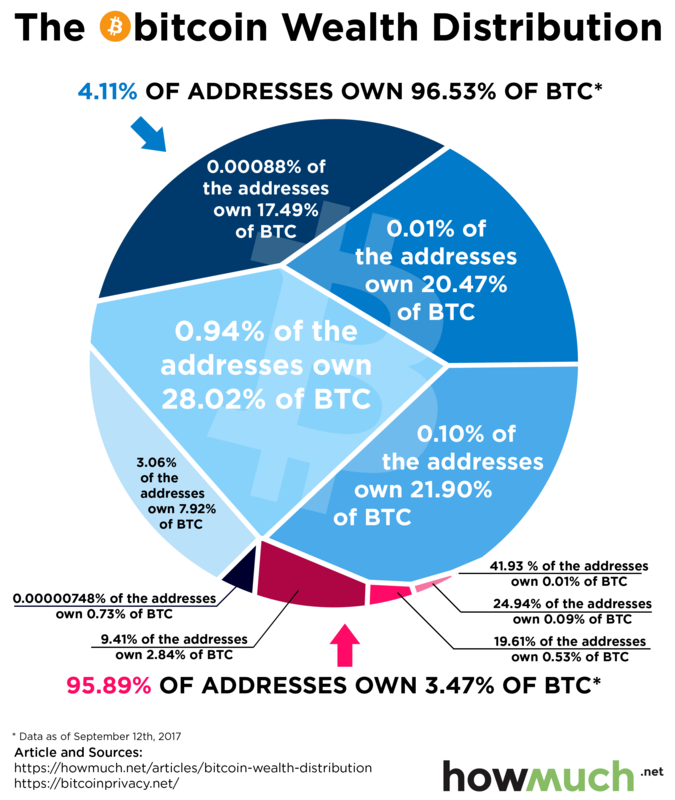 In fact, 1% of the addresses control half the entire market. There are a couple limitations in our data. Most importantly, each address can represent more than one individual person. An obvious example would be a bitcoin exchange or wallet, which hold the currency for a lot of different people. Another limitation has to do with anonymity. If you want to remain completely anonymous, you can use something called CoinJoin, a process that allows users to group similar transactions together. This makes it seem like two people are using the same address, when in reality they are not. So it’s a complex situation. but let’s try to break bitcoin down as simple as possible. Bitcoin is just a type of money, like dollars and euros. The main difference is that there isn’t a sovereign government backing the currency, and it instead lives online. This is possible thanks to something called the blockchain. Banks and companies must keep detailed records of where they send money, marking it possible to detect fraud and criminal activity. The blockchain works differently because it breaks each transaction into tiny components, routes the pieces through a computer network, and directs them to a recipient who can then re-assemble the code together. If you don’t have the right key, you can’t own a bitcoin. And if you aren’t at the right digital address (think your home network’s IP address), then you can’t receive bitcoin. The technology is hard to understand, and it presents challenges for companies and people who want to use it. That’s why folks typically turn to a vendor like Coinbase to handle their transactions. You know how you carry physical money in your personal wallet? Think of Coinbase as a digital wallet. You use it to buy stuff and pay for services. But be careful—people can steal your digital wallet, and the thieves can be untraceable. And that’s the issue. There’s only a very limited number of bitcoin wallet providers out there. It’s not like you can just go to your local bank and buy some bitcoin. The big takeaway from all this is that if you are considering purchasing some bitcoin, you have very limited options. There are only a few key players in the game where you can park your investment. And if you do make that purchase, understand that it is highly speculative and unregulated, so prepare for a bumpy ride.